We have been told that the Tulnar (meaning The Forgotten) are a cumulation of the many different races that were left behind after all others had fled through gateways to escape the disaster that was befalling the world at that time. According to the the AoC Team, the races that were unable to escape through the gateways evacuated to the Underrealm to protect themselves from the occurring disaster. Overtime, the interbreeding of these races resulted in what is now known as the Tulnar. Concept art shows these beings as having mammalian, reptilian, and humanoid like features. The most notable features are claws and a tail. Indeed, the silhouettes shown seem to reflect a species that is both robust and agile. So how would the past have affected the race as a whole? Who knows what the original people encountered as they began making the Underrealm a home: monsters, scarcity of resources, the shock of losing everything so quickly. I believe they would have developed core values of perseverance, courage, and teamwork; and then passed these on down the generations. As well, coming up against previously unknown monsters would have necessitated learning new fighting skills as well as the need to design new types of weaponry and armour. We have been told that the Underrealm does not contain the same resources as aboveground. Weapon and armour crafters would thus need to learn to make use of any new materials that they discovered. And those practicing skills such as alchemy and cooking would need to invent new concoctions and recipes. So how will the Tulnar, who have lived underground for so long, react to finding out that all the races who abandoned the world are now back to explore and claim it's resources? Will they view the other races as cowards and opportunists or will they hope to reconnect with them and pass on their knowledge of the world? Will the Tulnar help the others in creating metropolis’ or will them see this as desecrating the environment and seek out to destroy those who would try and change the pristine beauty of this world? And how will the races returning to the world feel about the Tulnar? Will they view them as impeding civilization and try to wipe them out or will they seek their invaluable knowledge ? Most importantly, what could this mean for those who choose to play a Tulnar? Well, for starters, the physical features of the Tulnar may lend them to being better in tank, fighter, and rogue roles, especially if the AoC Team decides to incorporate those features into the race’s skill set. The AoC Team will likely make some alchemy and cooking recipes require ingredients that can only be obtained in the Underrealm; thus, promoting trade. Or even take it a step further and have it so only a Tulnar has the knowledge to make certain potions that could be needed by other races (i.e. to increase the chance of defeating Underrealm monsters). As well, as I mentioned before, certain materials for forging weapons and armor may only be found in the Underrealm. Perhaps the Tulnar could receive a mining buff in this area with a higher chance of receiving a rare item. How the server players choose to view the Tulnar may also affect pvp. For instance, if the server players tend to view the Tulnar as uncivilized beings who are trying to impede their progress, they may band together to try and destroy them. Likewise, if the Tulnar players choose to view other races as cowards and opportunists, they could make it their mission to destroy all nodes. 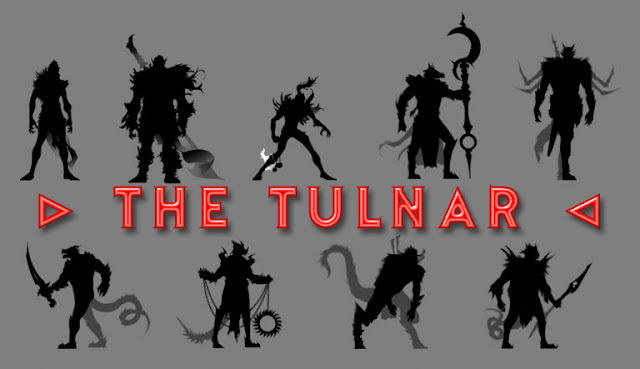 In ending my musing, I must say that I am very excited about learning more about The Tulnar race and what they will bring to the game. Their unique circumstances should lend them to have a strong impact on the players and world around them. Let's just hope the other races are ready for that.